Painting kitchen cabinets has become a huge trend in the design industry. You can see pages upon pages of photos of painted cabinetry on Pinterest and Houzz. Many with tutorials for painting your own cabinets. If you are not a DIY’er and you want your cabinets painted, I recommend that you hire a faux finish painter or decorative artist to paint your cabinets. Artists know the right products to use. There is a right way and a wrong way to paint cabinets. Your cabinets are the most expensive item in your kitchen. Get the wrong paint job and your cabinets (and your home) will lose value. Use the wrong products and your cabinets will chip and peel. Use the wrong products and you will still be able to see the wood grain from the oak. An artist will use a water based pre-cat lacquer, pigmented colorants for glazing, and a specialized top coat for superior surface protection. The kind that can’t be bought at your local hardware store. Do it right and your kitchen will have an instant update that will add value to your home. Putting your home on the market? An 80’s Oak Kitchen isn’t on anyone’s must-have list. But ……beautiful cream painted cabinets with a chocolate glaze is HIGH on that list. Cabinet Glazing is a fine art. If you want your cabinets to have the look of a high end kitchen you need to hire an artist. The right products and the right technique make all the difference. An artist will have access to the best products for the job and have the right eye for the detailed application. Artists keep up to date on the latest techniques and colors. As decorative artists we invest time and money in our craft. At Bella Tucker, we are members of our professional trade organization. We attend our national convention where we take classes every year to stay up to date on the latest products and finishes. The hot trends in cabinets right now are gray and white. We are specialists. Many decorative artists specialize in cabinet painting. That means we are experts in how to achieve the best finish for the best price and achieve the highest resale value in our market. And because our expertise is in kitchens we can also make recommendations on additional tweaks and changes that can update and add value to your kitchen. Artists have the best tools. We invest in the finest tools and spray equipment to provide the highest level of finish. Cabinets that show brush strokes or lap lines will devalue your cabinets. Here is a short video on our process. Artists know the importance of prep. Artists know that your completed finish is only as good as your prepared surface. Kitchen cabinets take a beating, they accumulate grease, they can have peeling or delaminating surfaces. They must be properly repaired, cleaned, sanded AND PRIMED, to achieve a finish that will last for years to come. The doors MUST BE REMOVED before painting. If anyone tells you they can skip any of these steps–R–U–N! Artists are competitively priced. We know we are competing for projects with traditional painters. We have to keep prices in line with the market where we work. When you consider the increased quality provided to the project by hiring an artist the value added is a significant advantage. Done the right way, painting your cabinets will be a significant improvement and upgrade. If you would like to discuss having your kitchen cabinets painted please fill out the form below or call us at 615-500-1517. Photo Credit: Geinger Hill. Great blog! I shall have to share! You do such beautiful work! Thank you for sharing and inspiring others! 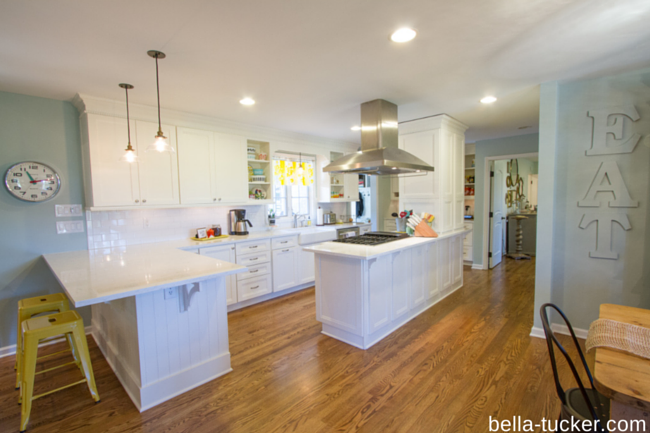 Can I ask….if I was to chalk paint my kitchen cabinets, would you suggest wax to seal them or some other topcoat? Thank you for any suggestions or advice you may have to offer.